On October 26th, 2011, china sand stone association announced the credit rating evaluation of the first batch of gravel industry enterprises. SBM won a top 3A credit rating evaluation. It was reported that the enterprises credit rating evaluation was launched by china sand stone association. This evaluation contributed to building the Sand and gravel industry’s credit system, increasing enterprises’ sense of integrity and self-discipline, regulating the order of competition within the industry, and promoting the development of industry. 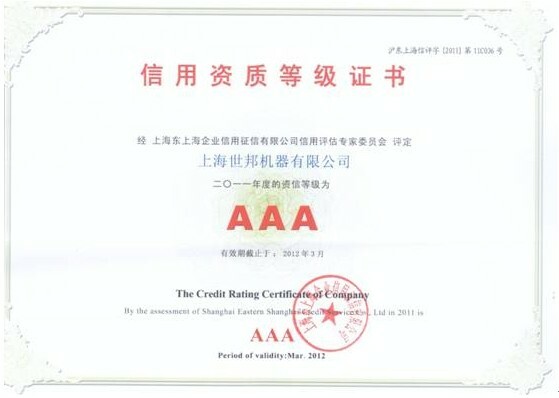 Finally, 15 enterprises were selected, 7 enterprises won 3A credit rating evaluation. It included SBM and 5 other mining machinery corporations.